Tiran and Sanafir Islands sit at the edge of the Red Sea near the Israeli port of Eilat and the Gulf of Aqaba. The port is Israel's only connection to the Red Sea and ports in Africa and Asia. It has been a pont of dispute for thousands of years, and more recently, prominent in the Arab-Israeli conflict. In 2017, Egypt's Parliament approved the transfer of these two islands to Saudi Arabia in exchange for billions of dollars investment into the sagging Egyptian economy. The islands have a strategic importance and the transfer does too. In 473, a Saracen calle Amorkesos took the island and claimed transit fees. This pattern followed from time to time for hundreds of years. Differing groups gained control of the islands and took transit fees. In 1906, the Ottoman Empire recognized Egyptian sovereignty over the islands. In 1954, Egypt took control of the islands, following lines drawn from agreements with the Ottoman Empire demarcating the border in 1906. In 1956, however, as part of the Suez Conflict, Israeli forces took the island in coordinated attacks with Britain and France. The United States and the Soviet Union opposed the move and the Isrealis withdrew. In 1967, Egypt restricted Israeli shipping through the Straits of Tiran. This act was one of the contributing factors to the 1967 Arab Israeli War. The islands are uninhabited and there are no known sources of energy under the nearby seas. The only value for the islands is strategic. In fact, Egypt restricted Israeli access to the Red Sea starting in 1948. Israel responded by seizing the islands which they subsequently held until 1982, when they were returned to Egypt under the Camp David accords. Eqypt and Israel signed a peace treaty in 1979. It guaranteed Israel's right of navigation through the straits and specifically in the zone around the two islands. The transfer of the islands effectively means that Saudi Arabia is the guarantor of the treaty, even though the Saudis have signed no peace agreements with Israel. Could this signal a regional ploy to build a common front against Iran? Tiran and Sanafir Islands occupy the narrowest part of the Strait. Tiran is only three miles from Egypt and four from Saudi Arabia. Nonetheless, Egypt agreed that it lay within Saudi Arabia's territorial waters. This case centers around the strategic value of the islands that sit at the mouth an important waterway. 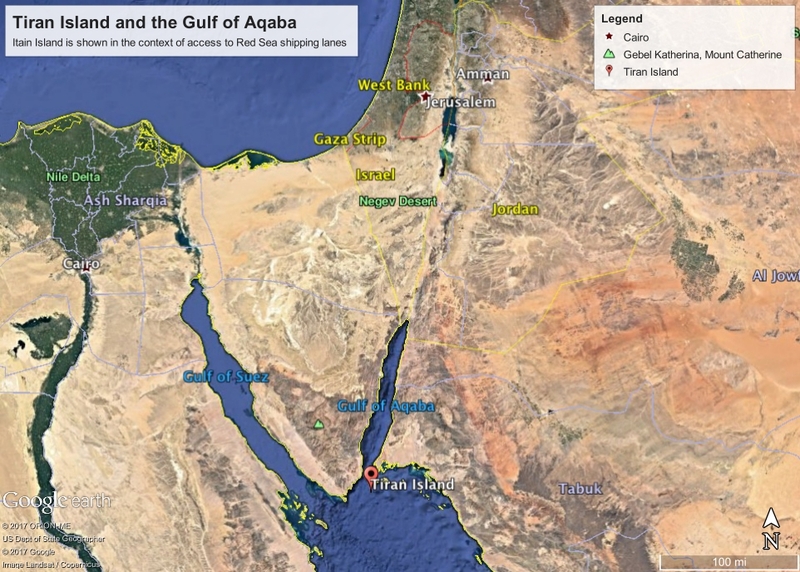 There has also been some discussion of building a bridge or causeway that would connect Saudi Arabia and Egypt via the islands. Israel reportedly agreed to the bridge proposal as part of the deal. This land bridge could help cement the Egyptian and Saudi economies. An Egyptian Court however has challenged the transfer. The treaty outlaws the stationing of troops by either Israel or Egypt. It is expected that the Saudi will respect that part of the treaty, but they do not seem legally bound by it. 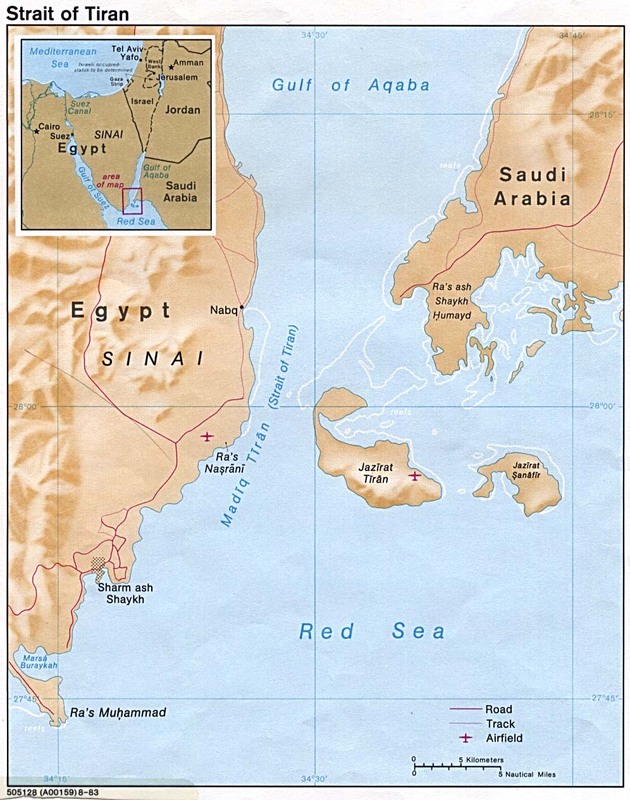 Since 1948, Saudi Arabia in fact left sovereignty in Eqypt's hands, knowing there navy could not defend the island. Statements from both sides suggest that the islands were always Saudi, but that in the tension of 1967, Saudi Arabia allowed Egypt the station troops and defend the islands since it did not have any rall navy at that time. But this contradicts some Egyptian claims make in the 1970s in the UN Security Council. The island trade required Israeli approval, since the move necessitated a change in an annex to the Israel and Egypt peace treaty of 1979. Multinational forces are stationed on the islands as part of the treaty. Jonathon Cook,"How Israel gains from Egypt-Saudi Red Sea islands deal", Al Jazeera, accessed June 23, 2017. Zvi Bar'el, "What Egypt's Handover of the Red Sea Islands to Saudi Arabia Means for Israel", Haaretz, June 27, 2017.